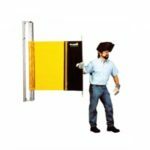 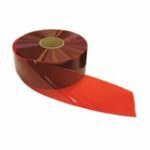 SB11000, the Safety Roll Up Guard offers your employees with the critical protection against weld flashes, bustling debris, with added advantage of preventing accidents by blocking access to dangerous machinery parts. 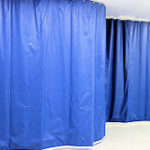 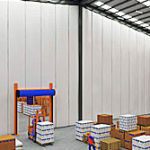 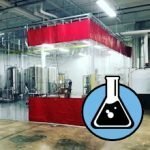 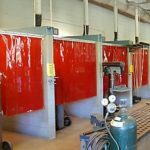 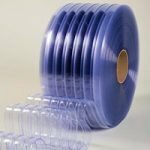 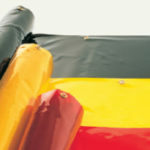 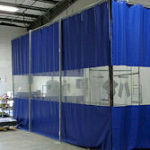 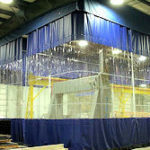 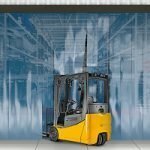 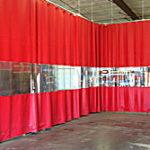 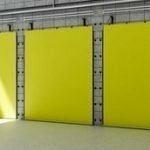 The innovative safety shield can be rolled up or down, and can also be rotated 360 degrees to facilitate complete access inside any work cell, a feature all other safety curtains fail to offer. 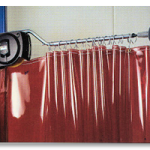 The curtain can be locked up in any upright position with a gentle tug on the provided nylon strap, courtesy of the robust ratchet roller. 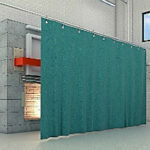 The integral design means the curtain is attached to the roller with the hook along with a loop fastener assembly making it very convenient to replace if damaged. 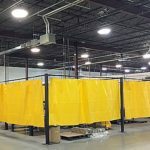 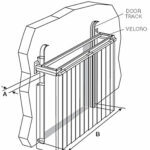 Depending upon the space available at the facility, the most suitable welding guard mount can be chosen from the options of free-standing mount base, hanging via chains or hooked onto a wall or beam. 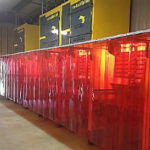 The various supported mounting styles make it possible to create uniquely designed small or large work areas for welding. 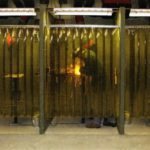 The roll down welding guard protects the by standers and fellow workers from harmful elements such as welding sparks and flying debris. 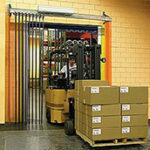 When not in use, the safety guards can be packed in any position either in full up or in full down position. 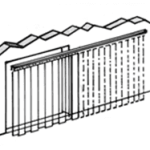 Working height can be adjusted with the help of the ratchet to lock the shade at the desired position. 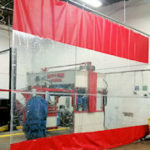 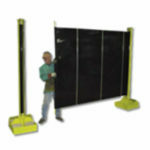 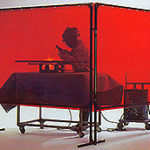 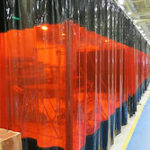 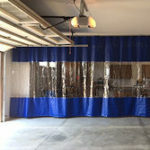 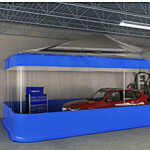 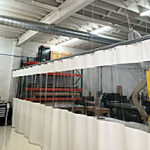 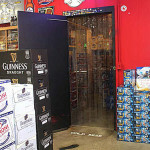 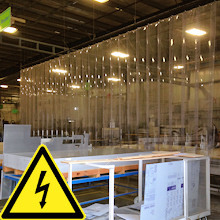 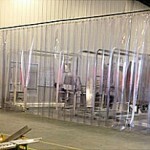 The Roll-Up Safety Guard can be mounted to the face of a wall or beam. 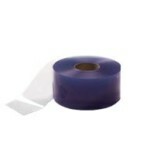 It can then swivel or be fixed in position. 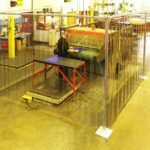 A floor pedestal which anchors into the cement floor can be used to mount the industrial roll up welding guard. 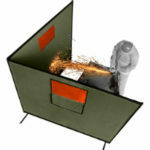 It can also swivel or be fixed in position like the wall mount. 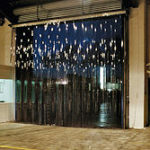 At no additional cost the standard chain supported mount is included. 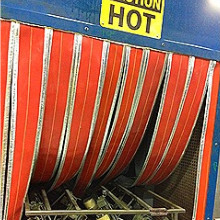 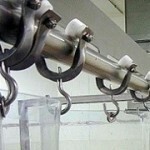 Chains drop down from above to hold up the roll up guard.